“Child’s play” was a horror movie that came out in the 80’s at a time when most of the movies that were being produced in Hollywood were not just horror movies but “slasher films” most of which were nothing more than low-budget “GrindHouse” fare. And like many of its contemporaries, although not a “slasher film” Child’s play in retrospect was an average film at best. The movie is about a doll named “Chucky” that comes to life after it is possessed with the spirit of a harden criminal named Charles Lee Ray the infamous "Lakeshore Strangler" as he is so named in the movie. The doll later goes on to become, should I say, quite the “little terror”. Despite its flawed story the producers of Child’s Play tried to capitalize on the brilliant use of “dolls” in other horror movies in order to make the story work. 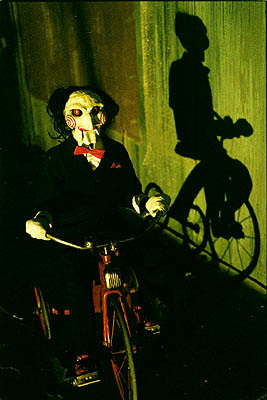 The most recent example of this was the sinister looking doll used to inspire fear in the “Saw” franchise. Fortunately that’s where the similarities between the two movies end. The doll in the movie, as you remember doesn’t do any of Jigsaw’s bidding as far as killing or torturing and although inanimate except for when starring in many of his “home movies” which he leaves for the “viewing pleasure” of his victims, the doll is quite disturbing nonetheless. Its something about seeing that doll sitting in a chair, its mouth seemingly moving on its own, to the voice of one very creepy sounding Tobin Bell who plays the homicidal maniac Jigsaw, along with the movie’s music playing in the background, the combination of the various elements leaves you chilled to the bone. I’m not sure if there were too many other instances in motion picture history where a message is delivered on screen with as much unsettling and horrific impact as it was the first time the writers of Saw initiated the clever use of a doll in this movie. Another example of the effective use of a doll on screen was in a movie I saw when I was all of 9 or 10 years old. 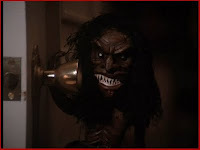 The movie was called The Trilogy of Terror. Although the premise of the first two stories escapes me, the final installment, I won’t easily forget. Karen black plays a woman who while out shopping comes across this little “warrior” doll that she apparently decides will go quite nicely in her home. Although as UGLY as this little guy was (and boy was he ugly you should have seen his teeth) I’m not sure how she could possibly want it or think that it could some how compliment her home’s decor. Nevertheless at some point in the story the doll seemingly comes alive and begins to terrorize the woman moving about her home with the precision of a highly skilled hunter stalking his prey. Imagine the absolute terror she must have experienced after hearing the pitter-patter of little feet piercing the quietness with in her home only to later DISCOVER the sound was from the doll that is suddenly not where she originally placed it. In hindsight, not only was the sight of that little ugly black doll with ENORMOUS razor sharp teeth scurrying about quite disturbing to me as a child but the clever way in which the director animated and contorted its already ugly face to look genuinely angry and more terrifying than how it previously looked before its sudden animated state. Another truly awesome use of a doll on the big screen was in the movie Poltergeist. The classic horror film by Steven Spielberg remains a personal favorite of mine since the day I saw it in the theater some years ago. The movie was about a family of 5, a couple and their 3 children whose home experiences arguably the most terrorizing poltergeist activity ever put on film. Of all the rooms that were experiencing the paranormal activity in the family’s home the one with the most belonged to the two youngest children. As if they didn’t have enough already to be afraid of, you know with the “monsters” in their closet and the “boogie man” lurking in the shadows? The room was typical of most kids rooms, there was a large number of toys and of course a number of dolls. But there was one doll in particular that their son Tommy didn’t care for much, a clown that sat in a chair across from his bed that appeared as if it was staring. Because the doll was a clown it had this “silly looking” smile on its face and although not disturbing, it was unforgettable nonetheless. 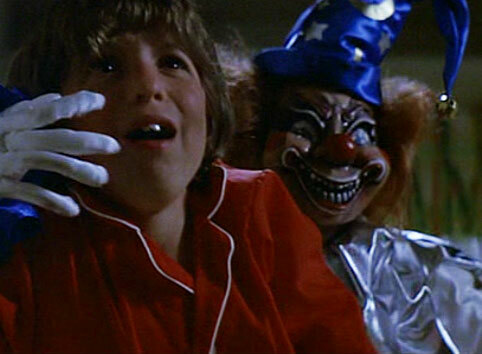 So much so that each night as the young boy attempted to go to sleep before he could put his head down he would cover the clown with something to prevent it from seemingly watching him. One night after the frighten child gingerly approaches the doll to that end he returns to his bed where he would struggle to fall asleep, periodically looking over his shoulder, in the dolls direction, to make sure it was still in the chair. Moments later the child repeats the process but this time he finds the doll gone, the boy’s fear heightens, now more evident as the shear look of terror extends the whole of his face. Just the act of looking under the bed, for a child is like peering into “the abyss of hell” as it is symbolic of the place where their worst fears are realized and so the only other thing, at this point, worst than having to look under his bed would be finding the dolls two eyes peering back at him from out of the darkness. But that’s not what happened is it? After Tommy discovers the doll isn’t under his bed he lifts his head back up and suddenly notices over his shoulder the doll behind him. And now with his fear at a crescendo the doll grabs the terror stricken little boy about the neck, takes him to the floor and not so coincidentally, drags him under his bed. Again another demonstration of the effective use of a doll in a horror movie and although it wasn’t scary in the same sense as some of the other dolls I’ve seen “running amok” on screen, the scene nonetheless worked quite nicely within the context of the overall story. Of course there are many other excellent examples of how dolls have been used for dramatic impact in motion picture history but the reason it works so well in horror movies is due to what dolls symbolize. For the most part dolls are synonymous with the innocence of a child but when they are utilized on screen in the many threatening ways they have been, mainly in horror films, the symbolism tends to get lost in a world where absolutely all things are possible and for the moviegoer perception becomes reality, at least for 90 minutes it does.